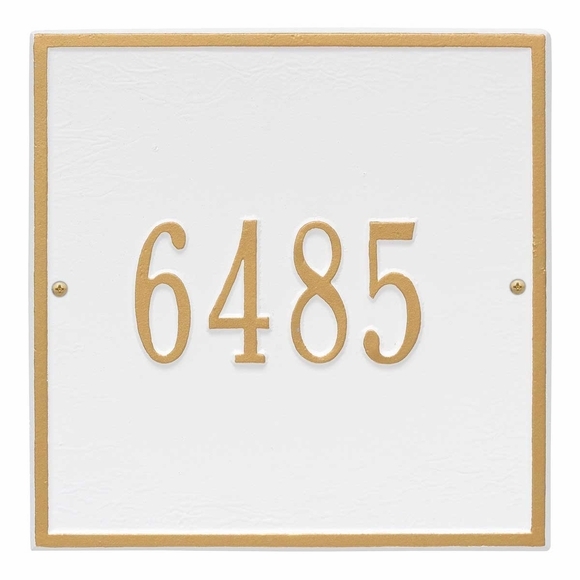 Square House Number Sign 11x11 - - square address sign. Made in USA. The house number line holds up to three 4.5" characters; five 3" characters; or twelve 1.25" characters. If not using all three lines, please leave the extra input boxes empty. Colors (from left to right in small images): AB antique brass; AC antique copper; BG black with gold characters; BS black with silver characters; BW black with white characters; GG green with gold characters; OB oil rubbed bronze; OG bronze with gold characters; PS pewter with silver characters; RG red with gold characters; and WG white with gold characters. House number shown in signs above: 6485. This sign also comes in larger 15" x 15" and smaller 6" x 6" sizes (see Related Products).